This Ford GT40 fetched $11 million on the Pebble Beach Auction block this weekend, making it the most expensive American car ever sold. 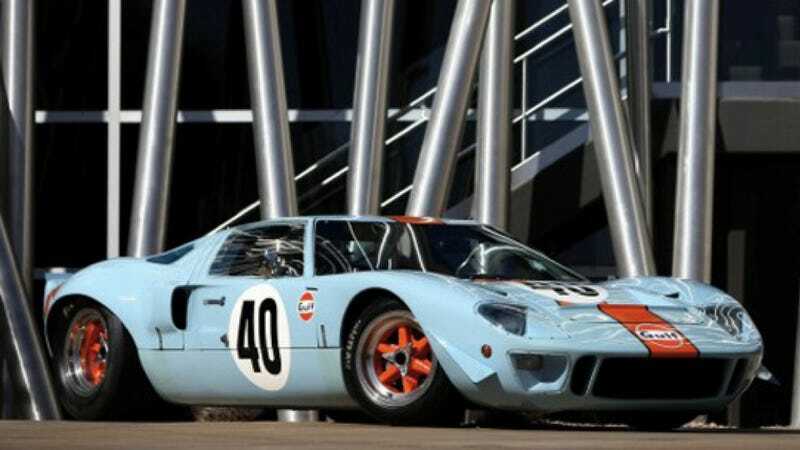 Extreme cost aside, this 1968 Ford GT40 Gulf/Mirage has a more unique history than most. It belonged to Hollywood's king of speed, Steve McQueen, and was featured in the 1971 racing classic, Le Mans. Hungry for more after filming Bullitt, which features the world's first live-action chase scene on the streets of San Francisco with beefed up versions of the brand new 1968 Ford Mustang and a Dodge Charger of the same vintage, Steve McQueen decided to outfit a GT40 for a live action race film. Easier said than done. He had a hole cut in the roof for one camera mount, and had one of the doors hacked up to accommodate a smaller camera, operated by some poor sap clinging to a flimsy swivel seat, at race speeds, outside the car. The result was what could be seen as perhaps the most car-focused movie in filmmaking history, although its focus on racing footage didn't leave much room for a plot (there really wasn't one). The chopped up car was eventually restored to its original condition by someone in its string of collector owners, and is still cool enough for someone to drop a cool 11 mil on it.